Slow performance certain ranks as one of the top computer user complaints of all time. If your computer is slow here are some things to consider. 1. If you have an old computer that doesn’t have any other performance related issues, it isn’t that the computer itself is slowing down but that technology may have passed it by. You may be trying to use applications that are more powerful than your computer. Many websites are more active and involved than they use to be which could involve using more memory and resources. Many computers that are sold “off-the-shelf” do not come with the optimal amount of RAM (Random Access Memory). Crucial.com has a Memory Adviser tool that can help you determine the options available for upgrading your computer’s RAM. Upgrading your computer’s RAM is typically an easy and inexpensive way to prolong the life of your computer. 3. Temporary internet files build up as you browse the internet. CCleaner is an easy and effective way to do basic system maintenance and take care of all of those files that build up over time. There is a free version of CCleaner also. The easiest way to run CCleaner is to right click your recycle bin and choose Run CCleaner after you have installed it. Make sure you allow that choice during installation. 4. There are two schools of thought on the “desktop files” issue. Some people insist that it doesn’t matter and then there are those of us who have seen anecdotal evidence for ourselves. Many people, whether they mean to or not, will save files to their desktop. Some downloads or program installations will default to the Desktop as a saving location. The Desktop is really meant to be have shortcuts to programs and files. While it doesn’t hurt to store a few files or small pictures on the desktop, storing large files can cause performance issues especially on computers that do not have good levels of RAM. Move these files to the My Documents folder or the My Pictures folder instead of your desktop and you could see an improvement in performance. Save downloaded files to the Downloads folder for temporary storage and if you need to keep them, move them to the desired location. To see the size of the items on your desktop, go to File Explorer by right clicking your start button or go to the “folder” icon on the task bar. Click “Desktop” on the left. Once the items are visible you may need to click “view” at the top and change to the details view in order to be able to see the file size. Once you are in the details view, click the “size” column heading to sort by file size so it is easy to determine which are the larger files. As a general rule move anything that is more than 500 KB. Ideally, you want mostly shortcuts on your desktop. Shortcuts are designated by an arrow on the icon. 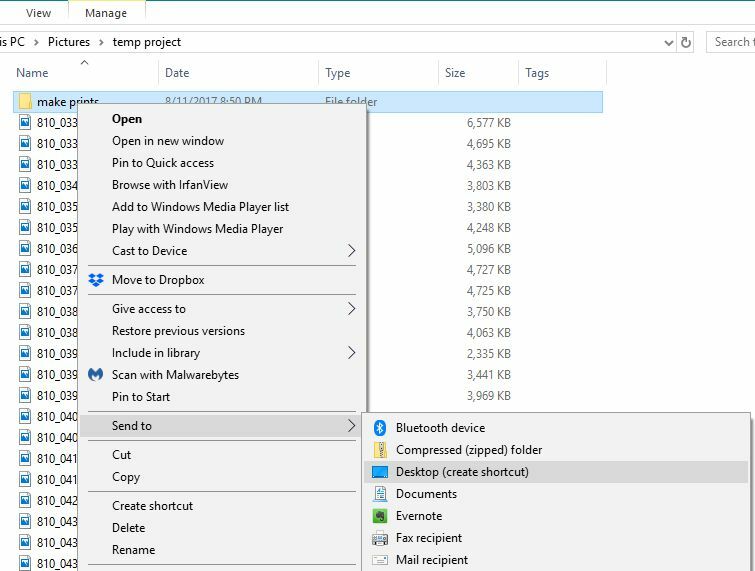 So, if there is a large file you want to have access to from the desktop, you can simply create a shortcut to it by right-clicking on the file from its location in File Explorer and choosing “send to” and then “desktop”. This technique stores a link to the file on your desktop without actually keeping the file there. Using shortcuts to have easy access to your files is a great way to personalize your desktop to make it efficient and effective for your needs without adversely affecting your computer’s performance. If these tips above do not work, The Computer Monkey can help you with your slow computer. Contact us if the above tips do not take care of the problem or if you just do not want to do it yourself. We can also give you advice and assistance in purchasing a new one if you decide that is the best option for you. Next post: Message to Windows XP users: Relax!